Share the Magic. Share the Joy. Share the Circus. Circus Flora’s founders were certainly people of vision. One of their most important visions, carried through to this day, was that the magic of circus be accessible to ALL! In that spirit of inclusiveness, we created the “Share the Circus” ticket donation program. 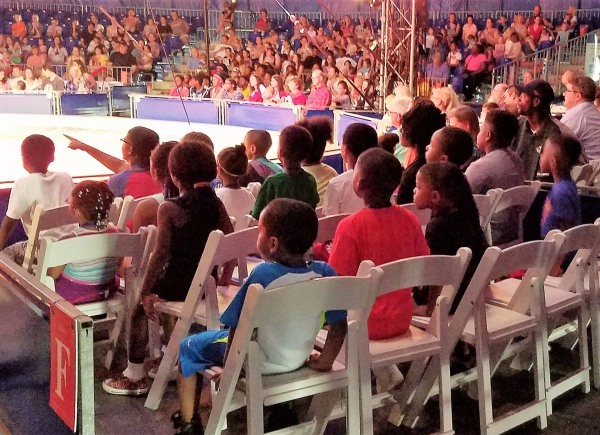 Established in 2003, the “Share the Circus” program distributes up to 3,000 free and reduced-price Big Top tickets to children and families in underserved St. Louis and Metro East (Illinois) communities each and every season. To do this, Circus Flora partners with over 30 nonprofit social service, education, and health organizations, who apply to receive tickets to a performance of their choice – including special engagements such as the “peanut free preview” and “sensory friendly performance.” “Share the Circus” allows groups from organizations such as Youth in Need and Women’s Safe House, who may not otherwise be able to attend, to experience the delight, wonder, and joy of Circus Flora – a truly magical respite from chronic illness, trauma, or hardship. You can sponsor the “Share the Circus” program here or, if you are a nonprofit organization interested in learning more about the “Share the Circus” program, please click here. We look forward to sharing the circus with you!